Are you a natural healer? Are you drawn to leading others? 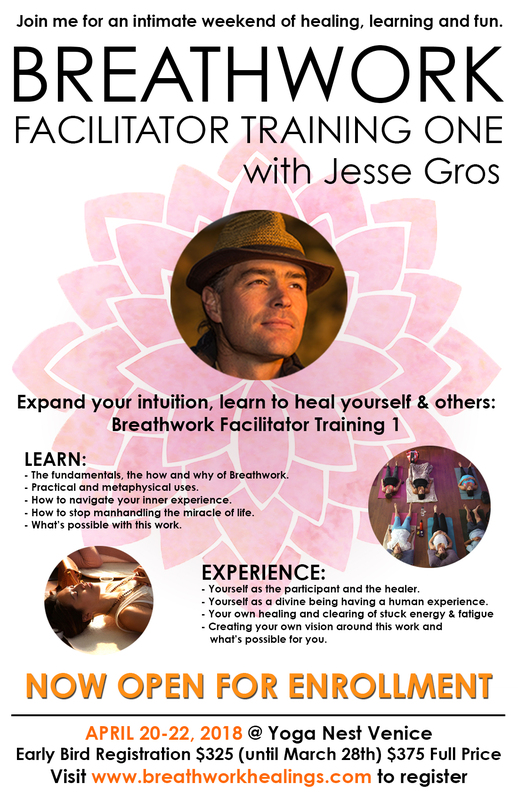 Join Jesse Gros for an intimate weekend of healing, learning and fun. In this class you will learn about the 2-stage Pranayama Breathwork meditation that is quickly becoming one of fastest growing healing modalities. Participate in group activities and partnered sessions to develop your skill in using this tool for yourself and others. Strengthen your ability to harness your intuition and natural knowing. Learn how use the breath on the goal line as well as the soul line. Our goal is that you leave this weekend open-hearted and aligned with your purpose. And that you leave with the skills and confidence to use Breathwork as a transformational tool in your own life and start you on the path to working with others. *This is class 1 of a 4-part series, training you to lead Breathwork on-one-one and with groups. *$150 deposit holds your spot.